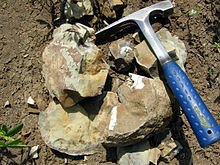 A broken concretion with fossils inside; late Cretaceous Pierre Shale near Ekalaka, Montana. 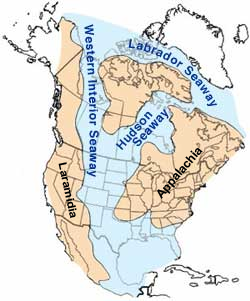 The earliest phase of the Seaway began in the mid-Cretaceous when an arm of the Arctic Ocean transgressed south over western North America; this formed the Mowry Sea, so named for the Mowry Shale, an organic-rich rock formation. In the south, the Gulf of Mexico was an extension of the Tethys Sea, which met with the Mowry Sea in the late Cretaceous, forming the "complete" Seaway. At its largest, the Western Interior Seaway stretched from the Rockies east to the Appalachians, some 1,000 km (620 mi) wide. At its deepest, it may have been only 800 or 900 metres (2,600 or 3,000 ft) deep, shallow in terms of seas. Two great continental watersheds drained into it from east and west, diluting its waters and bringing resources in eroded silt that formed shifting delta systems along its low-lying coasts. There was little sedimentation on the eastern shores of the Seaway; the western boundary, however, consisted of a thick clastic wedge eroded eastward from the Sevier orogenic belt. The western shore was thus highly variable, depending on variations in sea level and sediment supply. Monument Rocks, located 25 miles south of Oakley, Kansas. At a few times during the late Cretaceous the Western Interior Seaway went through periods of anoxia, where the bottom water was devoid of oxygen and the water column was stratified. At the end of the Cretaceous, a continuing uplift in a mountain-building episode called the Laramide orogeny hoisted the sandbanks (sandstone) and muddy brackish lagoons (shale) – the thick sequences of silt and sandstone still seen today as the Laramie Formation – while low-lying basins between them gradually subsided. The Western Interior Seaway divided across the Dakotas and retreated south towards the Gulf of Mexico. This shrunken, regressive phase of the Western Interior Seaway is sometimes called the Pierre Seaway. During the early Paleocene, parts of the Western Interior Seaway (marine waters) still occupied areas of the Mississippi Embayment, submerging the site of present-day Memphis. Later transgression, however, was associated with the Cenozoic Tejas sequence, rather than with the previous event responsible for the Seaway. Inoceramus, an ancient bivalve from the Cretaceous of South Dakota. The Western Interior Seaway was a shallow sea, filled with abundant marine life. Interior Seaway denizens included predatory marine reptiles such as plesiosaurs, and mosasaurs that grew up to 18 metres (59 ft) long. Other marine life included sharks such as Squalicorax, Cretoxyrhina, and the giant shellfish-eating Ptychodus mortoni (believed to be 10 metres (33 ft) long); and advanced bony fish including Pachyrhizodus, Enchodus, and also the massive 5-metre (16 ft) long Xiphactinus – a fish larger than any modern bony fish. Other sea life included invertebrates such as mollusks, ammonites, squid-like belemnites, and plankton including coccolithophores that secreted the chalky platelets that give the Cretaceous its name, foraminiferans and radiolarians. The Western Interior Seaway was home to early birds also, including the flightless Hesperornis which had stout legs for swimming through water and tiny wings used for marine steering rather than flight; and the tern-like Ichthyornis, an early avian with a toothy beak. Ichthyornis shared the sky with large pterosaurs such as Nyctosaurus and Pteranodon. Pteranodon fossils are very common and it was probably a major component of the surface ecosystem, though it was found in only the southern reaches of the Seaway. On the bottom, the giant clam Inoceramus left common fossilized shells in the Pierre Shale. This clam had a thick shell paved with "prisms" of calcite deposited perpendicular to the surface, giving it a pearly luster in life. Paleontologists suggest that its giant size was an adaptation for life in the murky bottom waters, where a correspondingly large gill area would have allowed the animal to cope with oxygen-depleted waters. ^ a b c d e Stanley, Steven M. (1999). Earth System History. New York: W.H. Freeman and Company. pp. 487–489. ISBN 0-7167-2882-6. ^ Monroe, James S.; Wicander, Reed (2009). The Changing Earth: Exploring Geology and Evolution (5th ed.). Belmont, CA: Brooks/Cole, Cengage Learning. p. 605. ISBN 0495554804. ^ "Oceans of Kansas Paleontology". Mike Everhart. Retrieved 2007-02-06. ^ Stokes, Keith. "Monument Rocks, the Chalk Pyramids - Kansas". www.kansastravel.org. Retrieved 7 April 2018. ^ Walker, Matt (24 February 2010). "Giant predatory shark fossil unearthed in Kansas". BBC Earth News. Retrieved 16 April 2013. ^ Benton, S.C. (1994). "The Pterosaurs of the Niobrara Chalk." The Earth Scientist, 11(1): 22-25.